Let’s say you’re a new graduate with $185,000 in federal student loan debt, with an interest rate of 5% per year. You just got hired at a job that pays $55,000, are single, and the poverty line in your area is $11,880. Pay As You Earn could come in very handy if you qualify. $309.83 instead of $1,962.21. Pretty neat, huh? Like IBR and ICR, your monthly payments under PAYE are based on the combined income and debt of you and your spouse if you file your taxes jointly. You can keep them separate by filing separately, but consider the tax ramifications if you do since you’ll usually pay more tax filing separately than filing jointly. Plus, you’re pretty much excluded from contributing to a Roth IRA since the income limit is $10,000 when filing separately. Capitalization of interest is an important component you should be aware of before choosing any income driven repayment plan. If your monthly payments under PAYE are less than the interest that accrues each period, that interest will build over time. It won’t compound though (you won’t be charged interest on your interest) unless it’s capitalized. 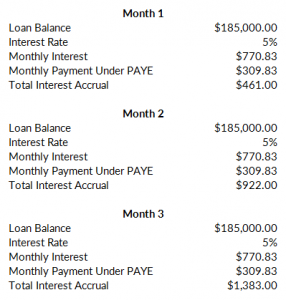 Once interest is capitalized it’s added to the principal balance of your loans, which is the factor used to calculate your interest each month. And of course, the higher your principal balance, the more you’ll pay in interest. You no longer have a partial financial hardship. In other words, your income rises to the point where your payments under PAYE exceed what they would have under the standard 10-year repayment plan when you entered PAYE. Accrued interest will capitalize if this happens, and your monthly payment would revert to what it would have originally been under the 10 year option. You forget to recertify your income one year. This is treated in the same way as if you no longer had a partial financial hardship. You leave the PAYE program. Another reason PAYE is mostly superior to IBR is that PAYE has a 10% cap on interest capitalization. The maximum interest that can be added to your loan balance is 10% of your original loan balance when you entered the program. In our example, this would be a maximum of $18,500. 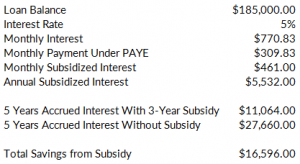 Also like IBR (but unlike ICR), under PAYE the government subsidizes accrued interest for your first three years in the program. If your monthly payments don’t cover the interest on your loans, the government will pay the difference on your subsidized loans for three years. The one downside of Pay As You Earn is that it’s only available to newer borrowers. To qualify, you must be considered a new borrower (meaning you didn’t have any outstanding federal loans) as of October 1st, 2007. Additionally, you must have received a Direct Loan disbursement on or after October 1st, 2011. This basically limits PAYE to the class of 2012 and later. If you meet these initial qualifications you must also have a partial financial hardship, just like under IBR. This means that your payment under PAYE is less than it would be under the standard 10 year repayment plan. If your income later rises to where you no longer have a partial financial hardship, you can remain in PAYE. Your payments would just be capped at what they would have been under the 10 year standard repayment plan when you entered PAYE, and your interest would capitalize. 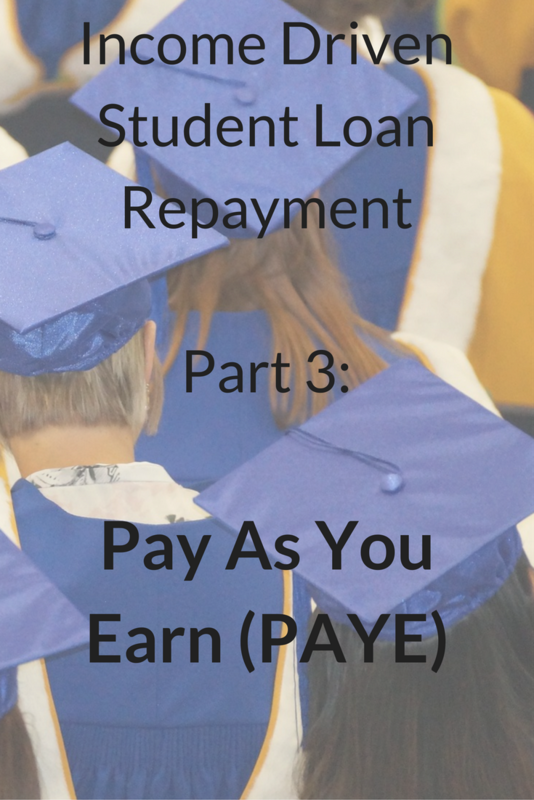 PAYE is one of the best income driven repayment options due to the low monthly payment calculation. The benefits don’t end there though. The interest subsidy, 10% cap on interest capitalization, and 20 year forgiveness period make PAYE an extremely attractive option. The problem with PAYE is qualifying. The plan is only available to more recent borrowers – basically the class of 2012 and later. If this is you, it’s hard to wrong with Pay As You Earn. To sign up for PAYE you can apply online at studentloans.gov. You’ll need to prove your income, which can be done using the IRS retrieval tool as long as you filed a tax return in the last two years. You can also fill out a paper application if you prefer. Just keep in mind that just like the other options, you need to recertify your income each year. Forgetting to recertify will mean that any accrued interest is capitalized and your monthly payment will jump. Student loan servicers tend to make a lot of mistakes, so make sure to keep copies of the paper trail. Remember that Pay As You Earn was passed by executive order – which does not require congressional approval. This means that future presidents could just as easily repeal PAYE if they choose. Hopefully, if this does happen existing borrowers in the program will be grandfathered in and shielded from changes to the program. Nothing is guaranteed though, and anyone concerned about the stability of the program might consider IBR instead. IBR was passed with approval from congress. Posted in Financial Planning, Student Loans and tagged pay as you earn, pay as you earn student loan repayment, pay as you earn student loans, paye, paye student loan repayment, paye student loans.